On Saturday, October 17, 1998 many people had no idea that within a few short days their lives would be changed forever. The day began with heavy rains that saturated the soil over a large part of the river basin. At first, it appeared that rainfall runoff would develop into a typical central Texas Hill Country flood, with limited coverage. But Texas weather can be extreme and unpredictable. Depending on weather patterns, there may be months or years of drought followed by a devastating flood. Arctic cold fronts sweep into the state as easily as moisture and storms from the Gulf of Mexico. The lesson to be learned is that given the right circumstances, a rare combination of weather events can shatter previous limits  including mans best efforts to determine the magnitude of floods. 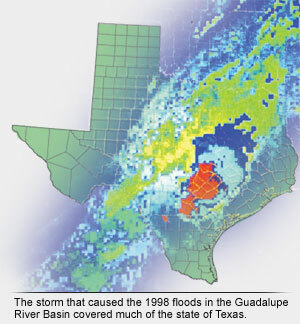 The flood of October 1998 is a good example of how two hurricanes, a strong low-level flow from the Gulf of Mexico, an upper level trough over New Mexico and a surface cold front combined to create the largest flood of the century for the upper Guadalupe River Basin and the worst flooding ever recorded in the lower basin. With the soil already saturated, rainfall from the intense storms quickly accumulated in creeks and rivers within the basin. The heaviest rains were concentrated along the storm tracks over southern Comal County, Hays County and northern Guadalupe County. Since the upper Guadalupe Basin consists of fairly steep terrain, especially between Canyon Lake and Seguin, the river experienced flash flood conditions. Damage in this area is characterized by the explosive nature of the flooding due to unusually high velocity. Many homes were completely washed off their foundations in New Braunfels, and severe structural damage to homes and businesses occurred downstream through Seguin. As floodwaters moved downstream, flows remained high but the water also began to spread out. The City of Gonzales recorded a record flow of 335,000 cubic feet per second (cfs) and flows at Cuero reached 473,000 cfs. In Victoria, the record flow of 466,000 cfs dwarfed the previous record flood of 1936 that measured a peak discharge of 179,000 cfs. Below Gonzales, floodwaters were several miles wide, inundating homes and businesses that had never flooded before. The magnitude of the floodwaters either inundated or destroyed stream recording gauges maintained and monitored by the U.S. Geological Survey (USGS) at New Braunfels, Luling and Gonzales, complicating the job of flood warning and forecasting. In addition, the speed at which the flood wave moved downstream was exceptionally fastless than half the typical travel time for flows up to 100,000 cfs. The 1998 flood resulted in a total of twelve deaths in the Guadalupe Basin. If a flood of this size and intensity had occurred in the middle of the night instead of during the day, the death toll would have been higher. Most of the deaths resulted from people attempting to drive their cars through a low water crossing and underestimating the depth of flow. Despite these staggering losses, more damage was prevented and lives were saved because the initial flooding occurred during daylight hours and because people listened to warnings from their local emergency management and law enforcement officials. They took valuable items with them when they evacuated, moved possessions to higher areas, and stayed away from low water crossings and roads that were forecast to be flooded. After the flood, it became apparent that many people did not understand how to file claims with the Federal Emergency Management Agency, what their flood insurance covered, or how they could have been affected when their home was not in the 100-year floodplain. This publication will provide you with answers to these questions. It should also convince you that the Guadalupe Basin rivers will flood again. If you live or work along the Blanco, Comal, San Marcos or Guadalupe Rivers you are at risk from flooding and need to learn how to prepare yourself for future flood events.